Life is crazy at times and throws twists and turns all the time. Carrie Addison was walking along the streets of Pittsburgh, Pennsylvania heading to her job at Mellon Arena where she worked as an assistant in the media relations department for the Pittsburgh Penguins hockey team. She was just in her second year at her job and loved it to death. It was fun and she got to work with hot hockey players and they also happen to be nice too. Carrie had gotten to know Sidney Crosby and they had become good friends as time went along. They would work out together, go to movies and just whatever best friends would do when hanging out. When Carrie got to the arena she headed inside to the offices and then to her desk. She sat down and turned on her computer and got to work. Her boss walked in a few minutes later and waved at her and then headed into his office. They had a photo shoot today and it was for the team photo. It was always a fun because everyone would be there. A little bit later on Carrie's boss came out of his office and headed over to her desk. "OK I think we need to head down to the ice for picture time, Carrie" said Jake Wilson, Carrie's boss. "Yes sir Mr. Wilson. I am right behind you." And they headed down to ice rink to get things ready for the team photo shoot. They were working and getting things organized with the photographer when some of the players were starting to head out onto the ice. The players were just hanging around and talking and waiting for Mr. Wilson to tell them where they would be put in the photo. Sidney came out a few minutes later and skated over to where Carrie was standing talking to the photographer. 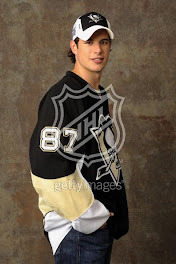 "Hey Sid nothing much just getting all this ready for an awesome team picture." "That's cool. Hey I was wondering if you wanted to have another one of our famous movie marathons tonight since it is Friday and neither of us has anything to do tomorrow. So what do you say?" "I think that might be fun Sid. I will make sure we have some snacks and drinks ok."
"That works for me, doll face." "Oh give me a break with that nickname thing Sid" Carrie said as she rolled her eyes. "Oh come on it fits you nicely because you are a doll as in a sweet person" Sidney said as he put his arm around Carrie's shoulders and smiled. "Fine now go and see where they need you for this picture" joked Carrie as she went back to talk with the photographer. Sidney skated over to where he was going to be in the picture. Finally all the players were out and it was picture taking time. "Ok guys please look at me and say 'Stanley Cup' on the count of three" said the photographer. "Stanley Cup" shouted all the players and snap went the camera. Okay I vaguely remember this chapter. Nice start!